Kobe Bryant has been voted to his NBA-record 15th consecutive All-Star start, leading four Los Angeles players into next month's game. Lakers teammate Dwight Howard and the Clippers' Chris Paul and Blake Griffin will join Bryant in the Western Conference lineup for the Feb. 17 game in Houston. Oklahoma City's Kevin Durant, the MVP of last year's game, rounds out the five. 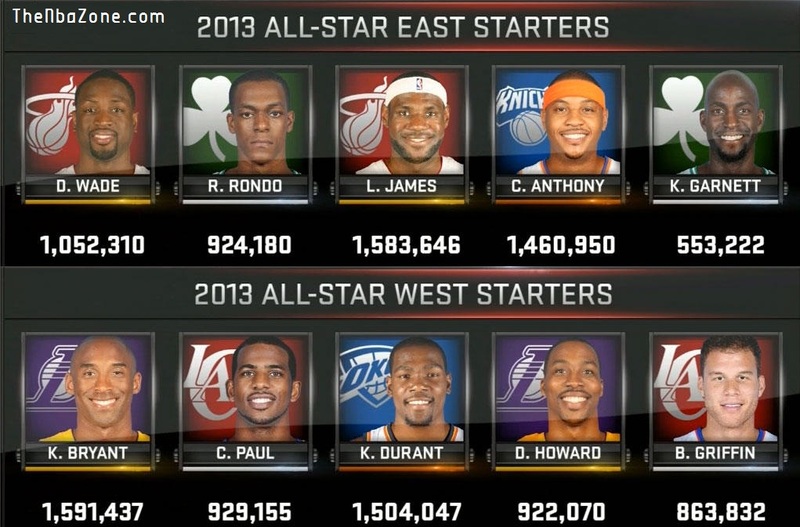 Kevin Garnett held off Chris Bosh in fan balloting, giving the East two Boston Celtics and two Miami Heat players. 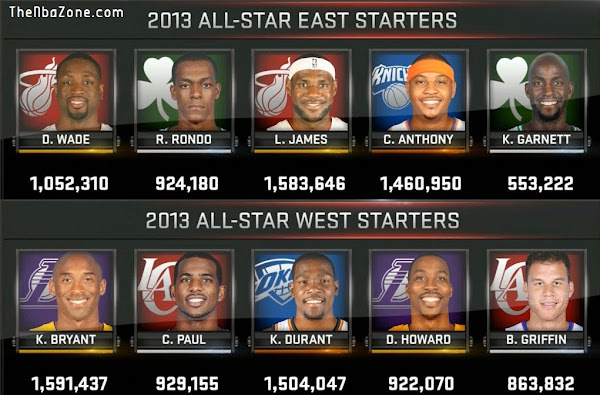 LeBron James and Dwyane Wade will represent the defending champions and receive passes from Rajon Rondo. New York's Carmelo Anthony is the other starter. Bryant finished with 1,591,437 votes, edging James by about 7,800 to finish as the leading vote-getter and break a tie with Shaquille O'Neal, Jerry West and Karl Malone for the most consecutive starting nods. The NBA's leading scorer is a four-time MVP of the All-Star Game and last year became its career scoring leader. Garnett beat Bosh, who took to Twitter to stump for votes in the final days of balloting, by about 25,000 votes. He tied Bryant and O'Neal for second all time with his 15th selection behind Kareem Abdul-Jabbar, who was selected to 19 games. It's the second straight year that Los Angeles teams will make up four players. Last year it was Bryant, Paul, Griffin and Andrew Bynum, who was dealt to Philadelphia in part of the deal that sent Howard from Orlando to the Lakers. The ballot changed this season, eliminating the center position. Fans were required to vote for three frontcourt players and two guards. They picked an interesting mix in the East. Anthony and Garnett exchanged words during a game on Jan. 7, and Anthony was suspended one game by the NBA when he tried to confront Garnett afterward in the tunnel area at Madison Square Garden and by the team bus. Rondo was injured in the playoffs two years ago after getting tangled up with Wade and landing awkwardly on his arm, part of what's become a tense rivalry between the Celtics and Heat. Reserves will be announced next Thursday. Coaches will vote for seven players in their conferences: two guards, three frontcourt players and two players regardless of position. They can't vote for a player on their own team.